Gloucestershire Cricket has announced a new partnership with kit manufacturer Samurai. The club appointed Samurai following a thorough tender process that took place over the winter. For the first time, players were involved in the project and were able to provide their input into the training and playing kit. David Payne was the lead team representative, and played a part with designing the team's new look training wear range. Speaking about his involvement in the project, David said: “Working with the guys at Samurai this winter has been a really great experience. "It was very interesting to sit in on the whole process and see how everything took shape. Head of marketing and commercial, Emily Salvidge, said: “We are really excited to be working with Samurai, and we have been very impressed with the quality of the kit and their creative design ideas. 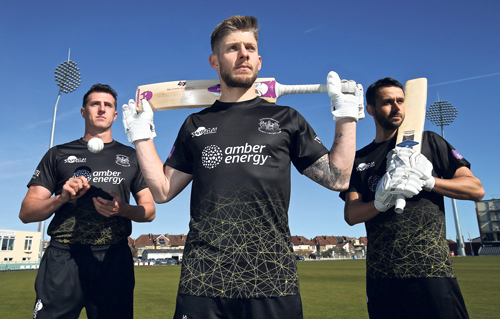 We are also looking forward to introducing a new retail line that members and supporters can purchase from the shop.” Samurai sports sear sales sirector, Mike Pells, said: “As a multi-sport brand we are delighted to have been appointed by Gloucestershire Cricket as their official kit supplier. "Our in house creative team have really embraced the challenge of producing a look and style the players were after. "Having our own factory has meant we have managed to design, manufacture and deliver a fantastic range for the team in the timescales required.